Got around to taking pictures and will take some more as this progresses however I wanted to share what I had so far. The black connector that is attached to the positive batter cable post is 24343. I started to merge the threads, but that sometimes upsets others. Last edited by jp2code; 11-02-2015 at 03:33 PM. Very helpful, how much did the cost? Seems like an item to keep in the drawer to me. Not bad, from the dealer none the less? Yep...Parts guy knew exactly what I was talking about too. I was quite surprised with their service. What is the deal with that frayed red wire that still goes to your battery post? Does that go to an aftermarket amp or something? If you get a chance to get back over to the dealership, you might want to see if they can get you an original style battery post clamp. Notice how the original lets the fusible link connector mount sideways so it isn't sticking up so high. So the red wire with the in-line fuse has replaced a fusible link (black one) that plugs into the other side of the fusible link connector that attaches to the positive battery post. 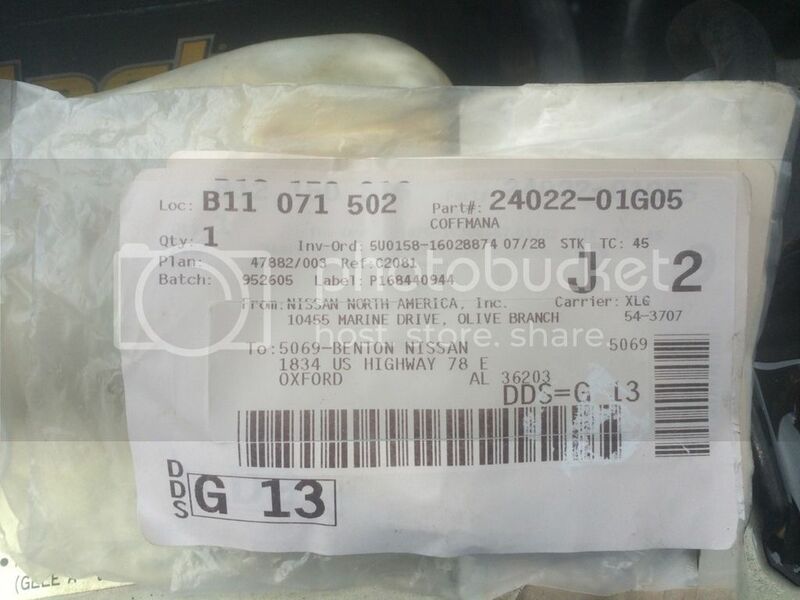 I have it and the part number and will add a picture/part #/cost when I swap it over. If you look at the connector in the picture you'll notice that nothing is plugged in to the bottom half of the connector. This is where that fusible link plugs in. I plan on getting another battery post connector and probably like the one ahardbody has (military style) because Nissan sells the entire positive cable/connector as 1 and its overly expensive for what it is (IMO). You could have no issues at all if all of the electronics in your truck are working correctly. The Factory Service Manuals do not specifically show everything that the fusible links feed to. 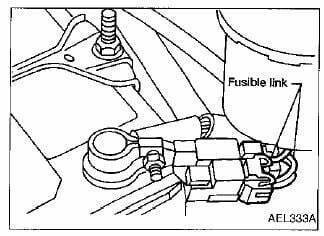 There are, however, numerous diagrams throughout the Service Manuals that show the fusible links in their diagrams. Every electronic component that is required by the engine should be protected by a fusible link. Electronic Fuel Injectors and the ECM are required by the engine, so they are on a fusible link. Headlights are NOT an engine component, so they get power from the fuse box. 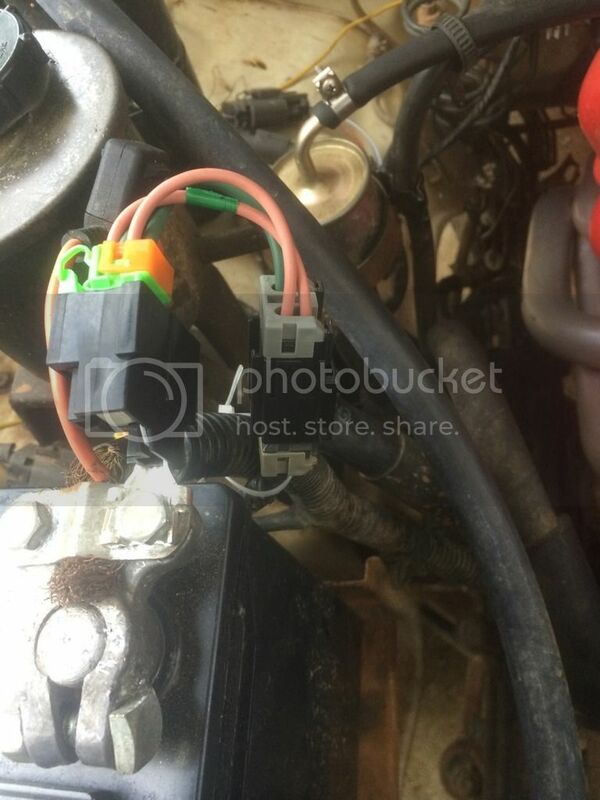 Note: Fusible links typically withstand greater amperages than fuses because they supply the vehicle with current straight from the alternator (think 60A range). Since they withstand more current, they can also be used to supply current to fuse boxes. If the voltage regulator inside your alternator starts to go out, it can send spikes through your vehicle's electrical system that would burn out all of the circuits. Instead, a fusible link burns into and your vehicle runs like crap until you get those replaced. Want to withstand an EMP blast? Carry an extra set of fusible links in your glove box. Now you are ready for a nuclear holocaust.